On OfferZen, companies create profiles to tell developers more about themselves. You’ll find info about the size of the company, location, hiring process, and tech stack. The profiles also have some fun features. Companies can add photos of their team and offices, and tell developers what perks they offer. We currently have more than 370 companies on OfferZen, and for this article we investigated the 2500+ perks they’ve listed so far. 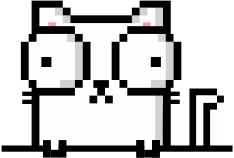 We started off by categorizing all the perks currently listed on OfferZen. We were quite liberal in assigning categories to specific perks. Anything from five extra leave days per year to a totally flexible leave policy we considered as Flexible Leave. Similarly, any perk that allows you to work somewhere other than the office any number of days per week we labelled Remote Working. We ended up with 32 different perk categories, and found that the top 5 perks on OfferZen were significantly better represented than the others. After categorising the perks we were curious to see how company size correlates with certain perks. The top 5 perks showed no real trends when sliced according to company size. Out of the 27 other perks, only 5 had some kind of pattern. As expected, the prevalence of medical aid and pension funds increases as company size increases. Of companies with more than 500 employees, over 75% of companies offer this perk. 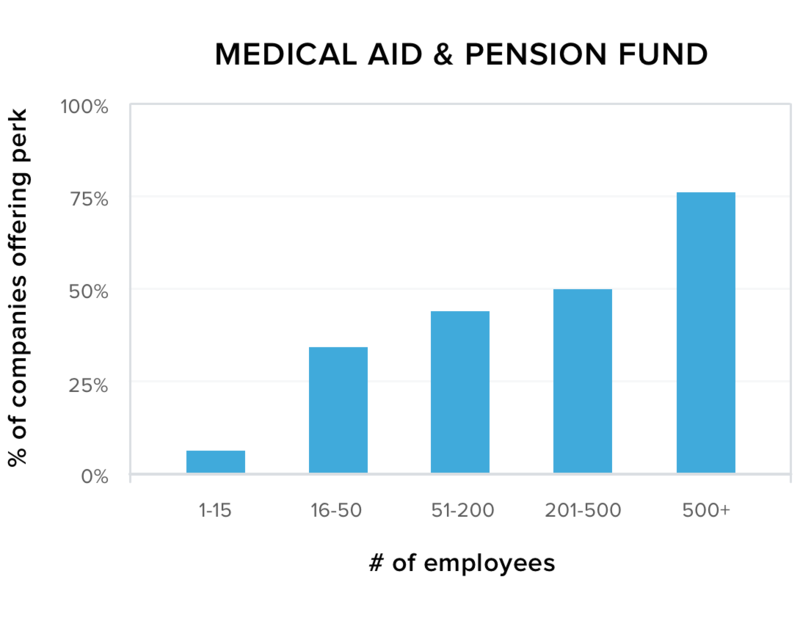 For Free Lunch we expected to see the inverse of the medical aid & pension fund graph. 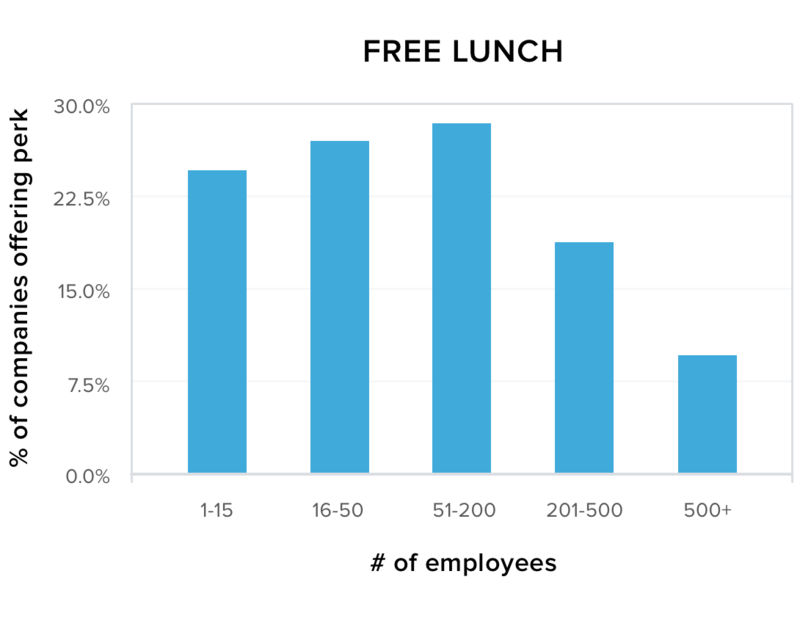 Instead, we found that for companies up to 200 employees, the likelihood of free lunch increases as number of employees increases. But with companies bigger than 200 employees, the prevalence of free lunch drops fast. At OfferZen we have both free lunch and healthy snacks for the team. We only started having team lunches when our team grew to about 12 people. For us lunches are not primarily about giving people food, but rather a set time in the day when the whole team spends time together. 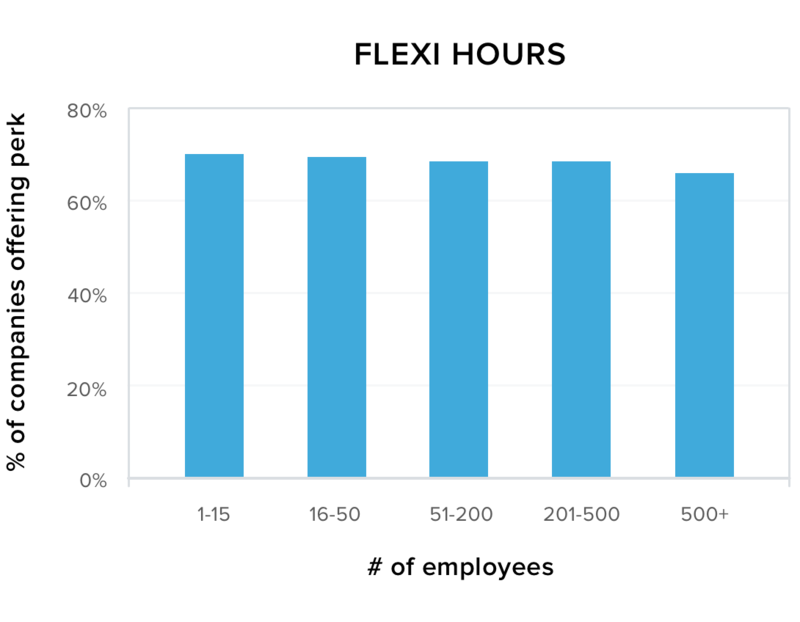 We were very surprised to see how Flexi Hours and Remote Working compare across companies of all sizes. 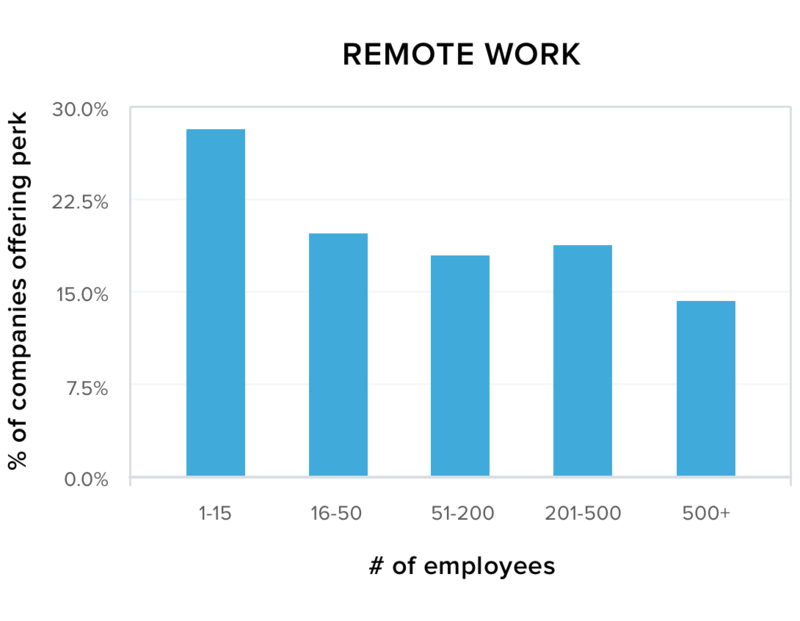 Although very small companies (1-15 employees) are by far the most lenient in terms of remote work, companies of all sizes seem to realise the benefit of being flexible about time and place. Keep in mind that the majority of these companies don’t offer fully remote work. Most allow only employees to work from home for one day a week. Many companies list things like “training and mentoring”, “certification courses”, “subscription to online courses”, “study bursaries”, “generous conference budget”, and “study leave” as perks. These perks looked like things related to formal training to us and we grouped them as Educational Opportunities. 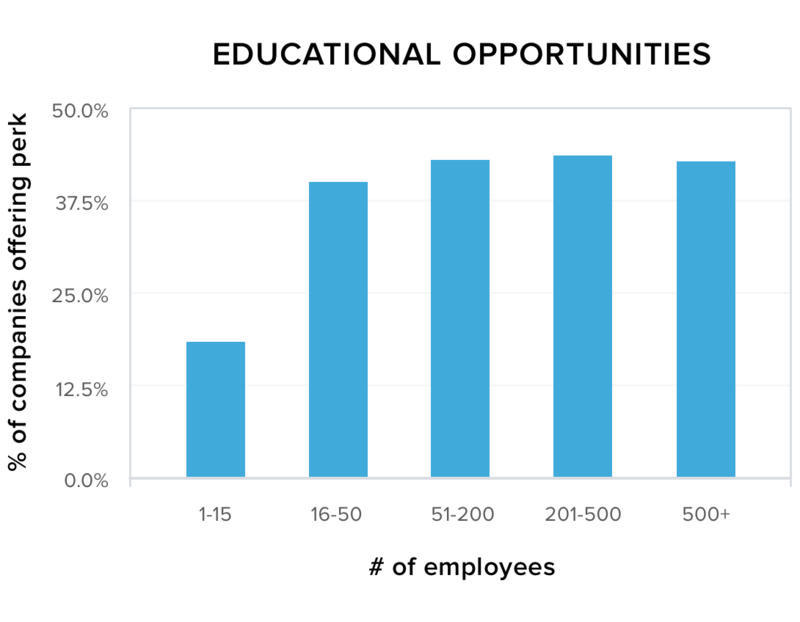 We are glad to report that many companies on OfferZen do care about formal learning. Educational Opportunities ranked 7th on our list of 32 perks. Companies on OfferZen have free reign to list whichever perks they think appeal to developers. This process lets companies communicate what they value and not necessarily what they offer. For example, a company can have a very relaxed dress code without listing it as a perk. Or they can offer medical aid contributions but not think of it as a perk. We see company perks as a mirror for company culture, and that appears to vary a lot among companies on OfferZen. Our perk data showed us two things about the variety of culture among companies. 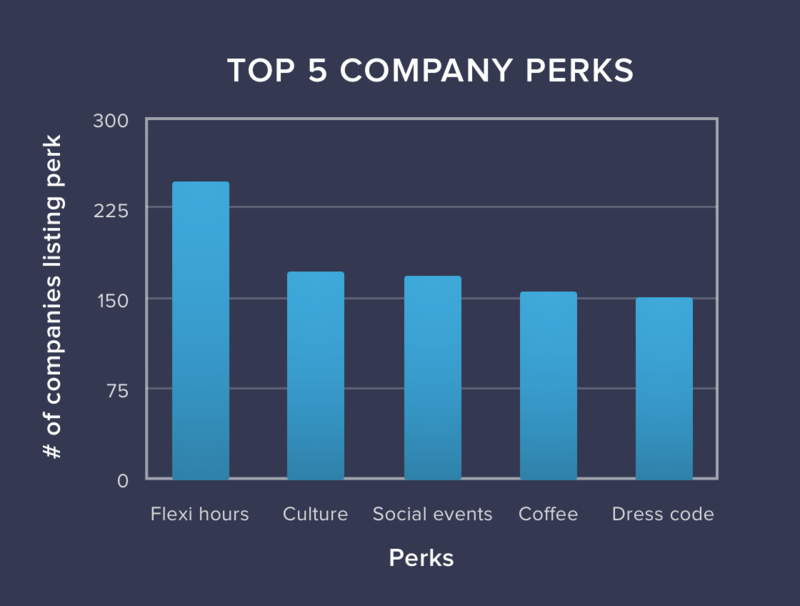 We identified 5 perks as the most frequently listed perks on OfferZen. However, only 1 of those perks (Flexi Hours) are listed by a majority of companies. The other f4 top perks are listed by less then 50% of all companies. Very few perks show definite correlation to company size.